All of these pissed off Russians are probably right. Image source. In case you weren't paying attention, Russia had a big parliamentary election a couple of weeks ago, and many Western observers have commented that the election was marred by widespread fraud - fraud perpetrated in order to continue the rule of Putin's party, United Russia. The fraud was so obvious that even the U.S. (via Secretary of State Clinton) has called Russia and Putin out on stealing this election. First, the above scatter plot shows that there were a large number of polling stations that experience perfect or near-perfect turnout, which itself is bizarre and extremely unlikely. Second, at these polling places, United Russia received an extremely high percentage of the votes cast (i.e. 90% or greater). 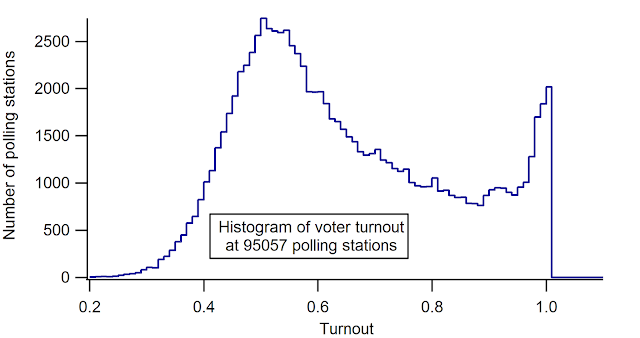 We would probably expect for the distribution of voting turnouts to be Gaussian - i.e. that it has a bell shape with one peak and very small values at the extremes (i.e. at 0% and 100% turnout). Obviously, the distribution of voting turnout in Russia in this most recent election does not follow a Gaussian curve. There is strong evidence for widespread vote manipulation in the 2011 Russian elections. While much of the press has focused on reports of voter fraud in large metropolitan areas, this analysis indicates that fraud may have occurred on a ever-wider scale in other areas. 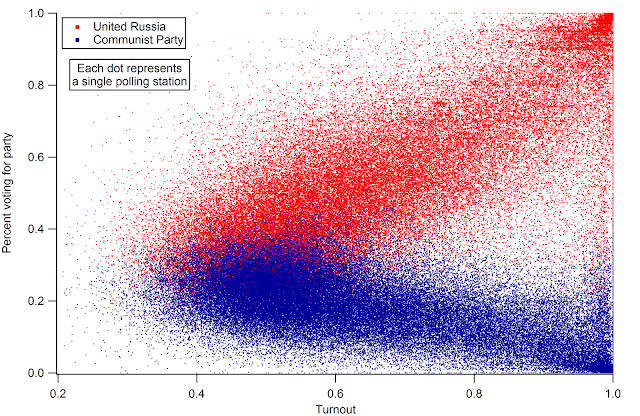 It is difficult to quantitatively estimate how much fraud occurred, but a simple estimate would be to see how many less ballots would have been cast for United Russia if the polling stations with the highest 20% of turnout voted along the same lines as the others. In this case United Russia would have received 3.54 million fewer votes. I haven't done the math, so I don't know the exact numbers, but given the incredible deviation from what's expected in the charts above, I would guess that the odds of a fair election having an outcome like the charts above is one in many trillion - i.e. that we would expect to see the above outcome less than once per the entire lifetime of our universe. 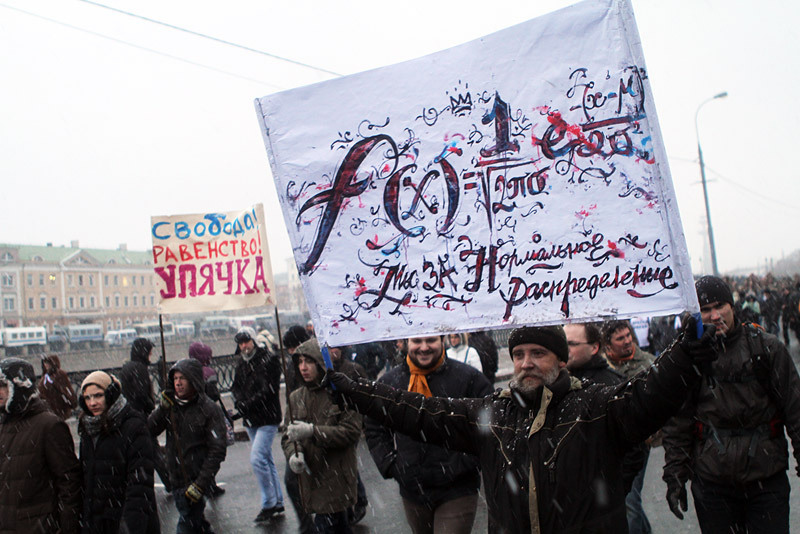 The banner says, "We are for Normal distribution." Aren't we all, my dear Russians, aren't we all. Image source. So, yes, the Russian elections were almost certainly fraudulent, and Putin is now likely clinging to power illegitimately. Thus far, Putin refuses to annul the results of this obviously fraudulent election. We'll have to see if the Russian people currently marching in the streets will be able to force him to change his mind. There's already a paper on the Popular Physics arXiv, by a gentleman with a Russian name, claiming that the Gaussian analysis is invalid. It's hilariously lame, but has good photos. Thanks, Joe, that's an awesome find! The argument made in the paper is, not surprisingly, nonsensical rubbish, but the photographs are awesome; I edited my post to include one of them.